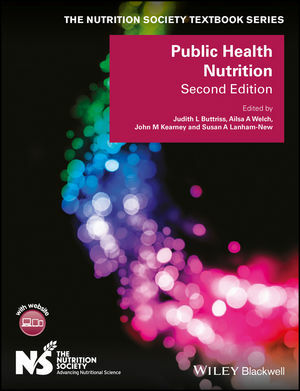 In this second edition of the bestselling title from the acclaimed Nutrition Society Textbook series, Public Health Nutrition has been extensively revised to ensure that it reflects the latest evidence-based knowledge and research. Ground-breaking and comprehensive in both its scope and approach, Public Health Nutrition has been fully updated by an expert editorial team to cover the most recent changes in the field. It now offers a structured overview of the subject’s core concepts and considers public health nutrition tools and the application of intervention strategies. Public health nutrition concepts and assessment tools, and their application in light of the latest evidence. Case studies to illustrate how best to apply the theory and evidence to policy and practice. An examination of nutrition throughout the lifecycle, and the relationship between diet and disease, including in relation to obesity, diabetes, cancer, as well as mental health. The impact of environmental factors on public health. Public health strategies, policies and approaches. With a clear and concise structure, Public Health Nutrition is an essential purchase for students of nutrition, dietetics and other healthcare areas, as well as an invaluable practical guide for health professionals working within public health. Professor Judith L Buttriss, Director General, British Nutrition Foundation, UK. Dr Ailsa A Welch, Reader in Nutritional Epidemiology, University of East Anglia, UK. Dr John M Kearney, Lecturer, Epidemiology, Dublin Institute of Technology, Republic of Ireland. Professor Susan A Lanham-New, Head of the Department of Nutritional Sciences, University of Surrey, UK.